One year after NASA pulled out of the project, European governments have agreed to a partnership with Russia on the ExoMars mission, which aims to send the next rover to Mars in 2018, according to European Space Agency officials. Before a two-day conference in Naples, Italy, European government ministers approved a draft agreement between the European Space Agency and Roscosmos - the Russian space agency - on a joint robotic Mars exploration campaign. "I can say this agreement is now in force," said Jean-Jacques Dordain, ESA's director general. The final agreement between ESA and Roscosmos is yet to be signed, but it could come before the end of the year or in early 2013. The dual-mission ExoMars project includes a Mars orbiter and small stationary lander set to launch in January 2016, and a rover scheduled for liftoff in April 2018. 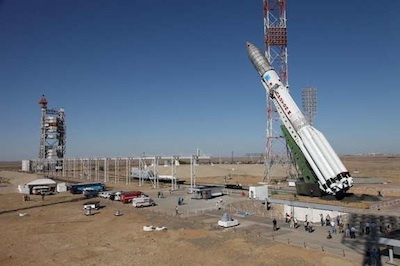 Russian Proton launchers will give a lift to both missions. ESA turned to Russia after NASA retreated from a partnership at the beginning of 2012, citing budget concerns. NASA spent the year evaluating its options for future Mars exploration, pursuing less expensive objectives and closer synergies between robotic and future human missions to the red planet. NASA is still providing limited equipment to the ExoMars program, including a telecommunications payload for the orbiter, which can relay data and commands between Mars landers and Earth. In early November, NASA Administrator Charles Bolden gave Dordain a formal commitment the United States would finance a significant instrument on the ExoMars rover, according to John Grunsfeld, associate administrator for NASA's science directorate. The joint U.S.-European instrument - named the Mars Organic Molecule Analyzer, or MOMA - will heat Martian soil with ovens, allowing sensors to look for markers of organic molecules. "It shows that NASA is really interested in continuing the development of this next-generation instrument and flying it in ExoMars," said Jorge Vago, ESA's ExoMars project scientist. "We are convinced that the new capabilities of MOMA, paired with the subsurface drill, will provide exciting new science results on the presence and distribution of organics on Mars." NASA may also provide software, expert advice and navigation support for the entry, descent and landing system on the rover, which will be comprised of mostly Russian parts. Europe is responsible for the computers and guidance system on the parachute- and rocket-assisted descent apparatus. 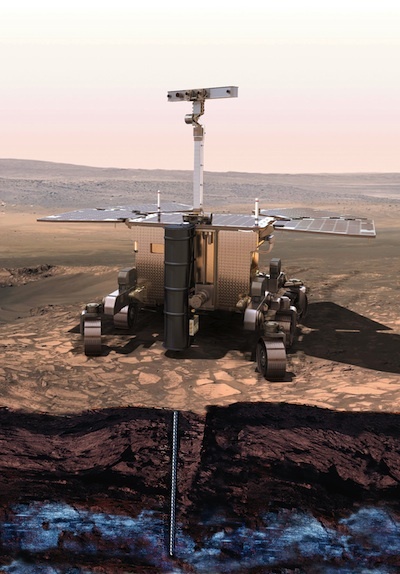 Besides the Proton launchers, Russia has agreed to build a descent stage for the European rover and provide scientific instruments to the lander and orbiter components of ExoMars. The approval of ESA's agreement with Russia is an endorsement of the ExoMars project from the agency's 20 member states, but the Europe has not secured enough funding for the dual missions. Although comprising two launches, the missions are bound together under the umbrella of a single program expected to cost ESA around 1.2 billion euros, or about $1.5 billion. Enrico Saggese, president of the Italian Space Agency, said there is still money missing from the ExoMars budget. European nations have so far only committed 850 million euros, or about $1.1 billion, to the ExoMars project. Italy is the largest European contributor to the ExoMars program. In an interview with Spaceflight Now, Saggese said Italy's financial commitment to ExoMars accounted for about 35 percent of Europe's overall ExoMars budget. Thales Alenia Space of Italy is the prime ExoMars contractor and lead manufacturer for the 2016 orbiter, which will seek out signs of methane and other constituents in the Martian atmosphere. Astrium in the UK will construct the rover for the 2018 mission, which is designed to drill into the planet's frosty subsurface and extract samples in search of organic and life-supporting chemistry. Saggese said he believes enough funding has been secured for the ExoMars launch in 2016, and the shortfall is mostly for the rover. A meeting of ESA's science program advisory body in early 2013 will decide whether to release funds to continue the ExoMars program. Europe has spent 400 million euros, or about $510 million, since it was initially approved by member states in 2005.